Metro is hard at work this holiday weekend to conduct some serious repairs on the Orange and Blue lines. They’re replacing almost 5,000 track fasteners, adding 5 miles of communications cable for cell phone access, repairing 21 escalators and 8 elevators, and replacing four track switches as part of the work. 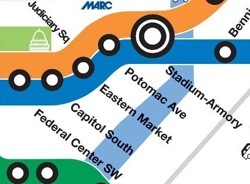 Capitol South, Eastern Market, Potomac Ave and Stadium-Armory are closed all weekend while the work gets done. Metro’s running shuttle buses through the area, so if you need to get to those areas covered by those stations, you can still get there, but plan for a lot of extra time to do it.